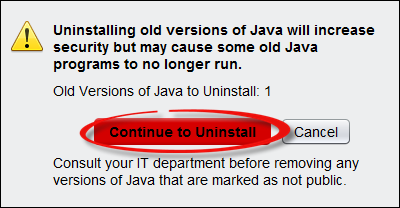 How to uninstall old versions of Java that may still be on your computer. Keeping old versions can be a security risk. 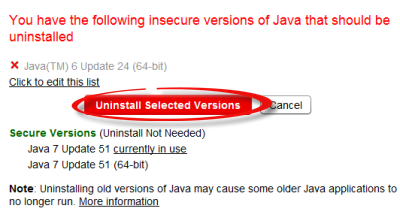 More information on why to uninstall old versions of Java. Step 1:Open your web browser. 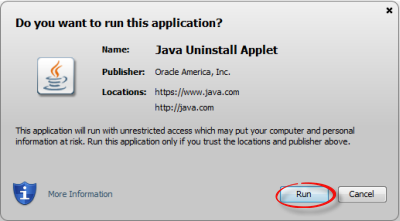 Go to http://java.com/en/download/uninstallapplet.jsp. Step 2:Click Run on any security prompts. Step 3:Click I Agree to the Terms and Want to Continue. Step 4:The insecure versions will be listed. Click Uninstall Selected Versions to remove them from your computer. Step 5:Click Continue to Uninstall. Step 6:Enter your username and password, if prompted.